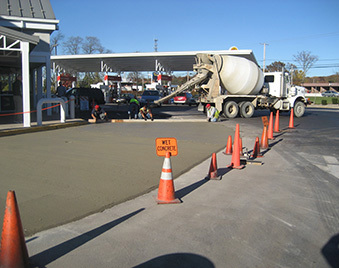 Our Concrete Division is comprised of a team of skilled craftsmen who can handle projects as small as a single sidewalk flag replacement up to a 10,000 sq ft pulverization and replacement. Our turn key packages are designed for us to get in and get out of a project with minimal impact. Most concrete areas are subject to pedestrian traffic (i.e. : sidewalks, curbs, parking pads, ADA ramps), therefore complete coordination and efficient project execution is required to minimize impact. Our systems are also coordinated in the field to allow pulverization of the concrete, immediate removal off- site to an approved recycling facility, base stabilization, form installation, concrete installation and finishing. 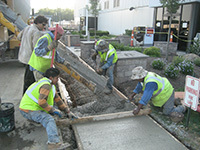 Currently we only offer exterior concrete flat work with the exception of dumpster enclosures. If you have interior concrete needs, please contact us and we will refer you to a reputable company. In retail stores, convenience store, gas station and quick serve restaurant parking lots, your front 10 – 30 parking stalls receive the most traffic. 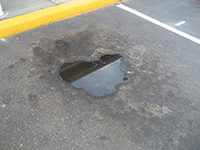 Common issues to experience in these front parking stalls are rutting from the tires and degradation from gas and oil. Both of these conditions lead to a future liability in the form of tripping hazards. These recessed and deteriorated areas also allow ice formation in the winter as they trap water. Your best option for long-term performance is to install a concrete pad in these heavily trafficked parking stalls. Depending on your budget, the most cost-effective method is to install the pad ten feet (10’) from the curb line. In other instances, we can install the pad twenty feet (20’) from the curb line. We offer a two-component epoxy striping material for long term striping application for the concrete after installation and proper curing. 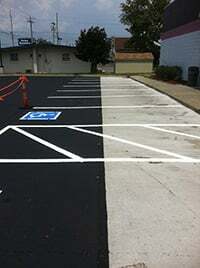 Traffic paint is not designed to adhere to concrete long term. DOT’s from across the country have determined that no striping material (Including hot thermoplastic and cold plastic) can outperform two-part epoxy. In addition to removal and replacement, we also offer concrete preventative maintenance to include: crack sealing, joint sealing, concrete sealing and cemeticious based resurfacers. Although concrete is considered a superior construction material with high tensile strength, preventative maintenance is still required to prevent costly removal and replacement. Expansion joints should be sealed with a urethane based flexible joint sealant with backer rod installation. Random cracks should be routed, cleaned and sealed with a urethane based flexible crack sealant. Concrete resurfacers can be applied to older spalled / pitted concrete to give it a fresh appearance. If your concrete is in good structural condition (No settling, cracks, heaving, etc.) and is just spalled, discolored, pitted etc., we can apply a concrete resurfacer to make the surface look brand new.